Call Our Metal Recycling Company Today! Looking for metal recycling services in the Abilene, TX; Midland, TX; and Snyder, TX area? At Snyder Iron & Metal, we provide a variety of services including scrap metal, used pipe, and other services. Give us a call today to learn more! 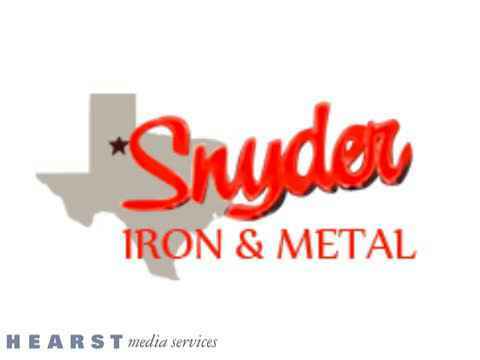 Snyder Iron & Metal, which started in 1975, is a full service, scrap metal recycling business with multiple yards located in Snyder, Sweetwater and Anson. With our three conveniently located yards, we are able to serve the entire Snyder, Abilene, and Midland, TX areas. Among our customer base are some of the largest oil companies located in Texas, New Mexico and Oklahoma. We are a large buyer of iron, tin, copper, brass, aluminum and nickel (such as stainless and monel). With state-of-the-art metal analyzers on-hand, we are able to maximize the price to the customer and to ensure all material is free of radioactivity. In addition to buying scrap metal, we provide roll-off containers and on-site demolition and clean up services. With our truck fleet, mobile shears, magnets and grapples, no job is too large. 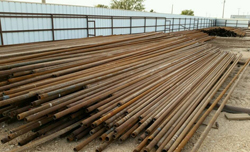 We also buy and sell large quantities of used oilfield pipe and rods for customers to use as structural pipe. We keep pipe, casing and rods in stock for customers looking to build car sheds, metal barns, fences and other similar structures. 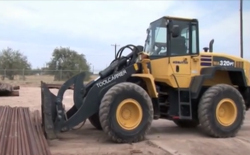 At Snyder Iron & Metal we buy and recycle all of your scrap metal in the Abilene, TX area. We develop long-term scrap recycling programs for both industrial and small businesses. With years of experience in metal recycling, we have earned a reputation for honesty, safety, environmentally sound business practices, and a sincere concern for those with whom we do business. Contact us today to see how our metal recycling services can help you turn your scrap metal into cash! If you are looking to sale just a few pounds or thousands of pounds, call us today for the latest prices. We provide three sizes of containers for our customers. We will deliver the right container for your commercial or personal needs exactly in the location that fits your requirements. Containers can be filled with ferrous or non-ferrous materials. Call us today for a container. 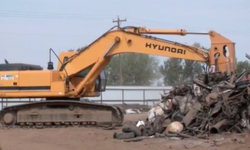 Snyder Iron & Metal also provides on-site clean up for companies or individuals looking to scrap large quantities of metal. With portable shears, magnets, balers, and car crushers, no job is too large. The company maintains a fleet of trucks with flatbeds, drop-decks and end dumps for performing clean up jobs quickly and efficiently. All of the yards are open to the public for weighing vehicles, trailers or any other item that needs an official weight. If you are needing to get a weight on state certified scale for inspection purposes, come to any of our locations at your convenience. The company has the latest, state-of-the-art analyzers to make sure when it comes to knowing exactly what kind of metal is being purchased. With our analyzers, customers can be assured they are getting the best price available for the metal they are recycling. When purchasing material out of the yard, customers can be assured the metal is not radioactive. Our staff is friendly, knowledgeable and has many years of experience in the recycling industry. We are always available at your convenience and are ready to answer any and all of your questions. We also buy and sell oilfield used pipe and rods. Pipe ranges from 1 7/8" upwards to 24" casing. Used pipe that the company resales is ideal for structural purposes such building fences, gate entrances, barns or car sheds. We keep plenty of pipe in stock in all three yards. Call any time to get the latest pricing available. Our Locations Pay the Most Competitive Prices in the Industry for Scrap Metal or Used Pipe! To keep things easy and convenient for you, we have three yards located in the heart of the Big Country and on the eastern side of the Permian Basin. Our yards are clean, no clutter and free of objects. You will find that getting into and out of the yards are fast, easy and convenient! Listed below are the addresses and phone numbers for all three yards serving the Snyder, TX, Abilene, TX, and Midland, TX areas. 208 N. Old Post Rd. Claiming your business listing couldn't be easier! Just fill in the information below to begin making the most of your listing and we will contact you shortly to complete the process. Thank you! Your message was sent! An error occurred submitting your info.